How does it feel to climb Sydney Harbour Bridge ? Have you ever experienced ? If no, here is your chance to experience one of the greatest views in the world. 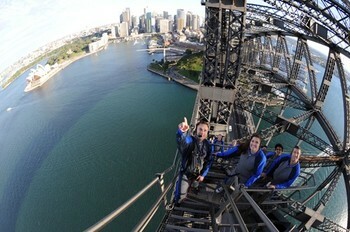 http://www.ultimatetravelmagazine.com has launched a great travel contest with BridgeClimb Sydney. If you are lucky, you and your friend can win one of four different BridgeClimb Sydney experiences worth AU$490. Just tell them in 25 words or less which BridgeClimb experience you would choose, and why. For details, you can visit their website. And do not forget to read their terms and conditions here.